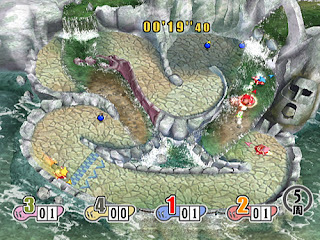 Developed by Masahiro Sakurai and HAL Laboratory, most famous for the Kirby and Super Smash Bros. series and more recently Kid Icarus Uprising, Kirby Air Ride offers a very unique racing experience. While Air Ride is arguably unbalanced, simplistic, relatively sparse in content, and overshadowed by Mario Kart: Double Dash and F-Zero GX, it is still a blast to play and more fun than it has any right to be. The basic controls of Kirby Air Ride are, well, basic, but in a good way. To move forward, you don't press anything and just move the control stick to turn. Then, to make a sharp turn, you hold A to start drifting and turning, which charges up a boost meter. After a second or two, if all goes well, you'll be aiming yourself down the next stretch of the track and upon releasing the A button will get a boost. There are also occasional enemies that you can inhale by tapping A which will give you various temporary abilities that you can use to get ahead or attack the other players. Gliding is also an important mechanic in this game and it's easy to pop off the track and fly through the air with the greatest of ease. 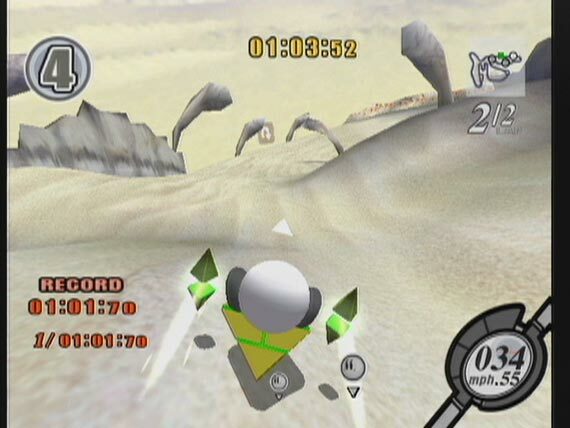 And one other point of mention is that you can draft off of other players by following behind them, which now is a commonplace feature in racing games, but at the time seemed pretty innovative, at least to me. The game itself, unfortunately, doesn't offer as much content as one might like. It is divided into three modes: Air Ride, Top Ride, and City Trial. Air Ride is your typical race. You pick a track, pick a vehicle, and race. There are only 9 tracks to choose from, but they are pretty well designed and fun to race on for the most part. There are also 16 vehicles to choose from (plus a couple more in City Trial) and each offers a very distinct experience. In fact, the play styles are so distinct that, while fun to play, there are always certain vehicles that are obviously the best or worst or suited only for particular tracks. In Top Ride, players control their vehicles from a top down view and race around one of seven much smaller tracks. There are only two vehicles available for this mode and they only offer different ways to control for your convenience. In both Air Ride and Top Ride there are a few options for those who are interested in setting Time Trials records. Last is City Trial, which is the most unique and tends to be everyone's favorite. I've owned this game since around when it came out and I still pop it in from time to time to play City Trial with friends. In this mode, you and three other players (computer or human) are placed in a "city" which you have a set amount of time to explore. During this time, you can collect power ups which increase your vehicle's stats to improve your top speed, turning, boost, glide, and others. There are also attack items which you can use to gain temporary abilities and attack other players, causing them to drop some of their power ups which you can then steal (so basically, this could be Nintendo's Twisted Metal if you wanted it to be). Also there are other vehicles scattered around the map at random that you can switch to if you want. During your time in the city there are occasional events, like boxes all containing the same item or a UFO appearing in the sky with items on it. At the end of the allotted time, everyone competes in a randomly selected minigame, which range from long distance gliding competitions to races to destruction derbies. Thus comes one of the problems: since certain vehicles have certain things they're obviously the best at, in a lot of cases, as long as you have a decent number of power ups, what really matters is what vehicle you have and whether it matches up with the minigame. This is most obvious when it comes to the long jump, high jump, and drag race, in which you can usually predict the winner just based on the vehicles that everyone has. Sometimes during City Trial, a message will appear, giving a hint as to what the minigame will be, so this somewhat takes care of the issue, but even still, the minigames rarely are won by skill in that challenge but by the skill of collecting the most power ups in the city. Suddenly, there's more to do in this game. Because of that, winning the minigames hardly even feels like winning. Which is why when my friends and I play, we make our own fun by just competing for the most power ups, trying to find our favorite vehicles first, or attempting the challenges on the checklist. "What? Checklist?" you say? Yes, that's right, where the game lacks in content it makes up for in having a giant grid of mini achievements for each of its three modes. Many of these just happen during normal play while others you have to go out of your way for. As you complete them, you'll be able to view the challenges surrounding the one you completed. You may have seen something similar before, as they used the same idea in Super Smash Bros. Brawl and Kid Icarus: Uprising. Certain challenges will even unlock new colored Kirbies, levels, music for sound test, and vehicles. So between the checklists and making your own challenges among friends, there is really a lot of fun to be had in this game. As for the graphics, they are crisp, clean, and colorful and look great in progressive scan mode. Also, the music is fantastic and contains a combination of classic Kirby music, music from the anime, and original music composed and arranged by the same composers who worked on Super Smash Bros. Melee. Kirby Air Ride was also the first Game Cube game to support LAN play via broadband adapters and up to four other consoles, something which I've never tried, but which still only allows four players total and only divides them between multiple TVs. 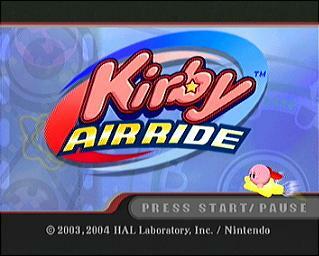 Kirby Air Ride may be lacking in content, but the core game that's there is a blast to play, especially with friends. If you enjoy going after achievements and making your own fun, this game is probably for you. In any case, if you haven't played it, you should definitely check it out. Does Leaning Forward Really Make You Play Better?